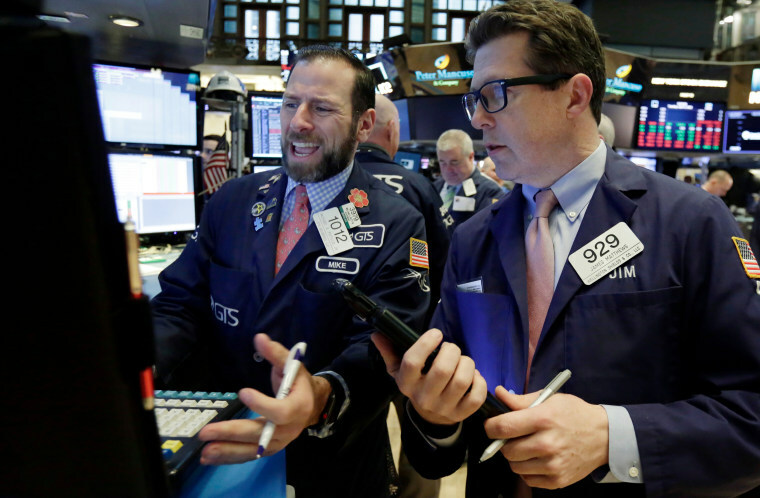 The markets on Tuesday recovered some — but not all — of Monday’s losses as the major indices continued to swing in a broad range, ushering in a bumpy start to the second quarter. The root cause of the new quarter’s volatility was set into motion a couple of months ago, said Joseph Lavorgna, chief economist for the Americas at Natixis. “The first and foremost factor, without question, is the Fed’s attempt to return to ‘normalcy,’" he said. “There’s no question the desire to get rates back up to a non-emergency level and at the same time letting the balance sheet unwind are profound events,” he said, pointing to better-than-expected wage growth in February’s jobs report as the catalyst that sparked the first wave of selloffs, when investors fretted that inflation and interest rates might increase more rapidly than corporate America had anticipated. “Since the Feb. 9 correction, we’ve been stuck in kind of a channel, for the equity markets at least,” said Darrell Cronk, president of the Wells Fargo Investment Institute, citing a number of factors weighing on stocks. “Concerns around global trade, concerns around the technology space as a number of tech stocks have come under heavier scrutiny… has led the correction to the down side,” he said. Some saw a common thread connecting the sources of the recent volatility. Market observers predict that the current stretch of volatility, which began in early February, is here to stay for another two or three months. “It’s very normal for a correction to last four or five months,” Cronk said. “You probably wouldn’t be retesting the January highs until May or June,” he estimated. “When we have volatility events, they do not tend to be one-off events,” Lavorgna said. “Volatility spikes tend to be measured in terms of months,” he said, and high valuations magnify the impact. “Once people start to raise risk premia, events that might have been ignored in the past aren’t ignored,” he said. Aside from Washington, D.C., the other place where market-watchers point fingers is Silicon Valley. “Big stocks go up and down all the time, but the trouble is these tech stocks comprise so much of the indices,” said Dan North, chief economist at Euler Hermes North America. The outsized impact of the so-called FAANG stocks — Facebook, Amazon, Apple, Netflix and Google — can drag down a broader swath of the market, he said. Facebook’s data privacy scandal, Apple’s disclosures about slowing down older iPhones, and President Donald Trump’s continued barrage of invective against Amazon and its CEO, Jeff Bezos, create a cumulative effect on the market. “Anytime you get a Tweetstorm against somebody, it’s a bad day,” North said. Although not of the same size as the FAANG companies, North said Tesla’s highly publicized production woes add to the malaise affecting technology stocks. “Tesla [is] not profitable, it burns through cash… it’s having production problems,” he pointed out. A bigger issue, many said, is the prospect of trade wars on multiple fronts, as China implemented retaliatory tariffs on a host of U.S. exports and Trump took to Twitter to call into question both NAFTA and a recently announced trade pact with South Korea. “The basic problem underlying everything is the trade issue — that’s the one that counts, long term,” said Dwight Johnston, chief economist for the California Credit Union League. “The economy is fine — we still have tax benefits coming, earnings are good… the other stuff can sort itself out,” he said, but companies and ordinary investors alike don’t have a road map to follow the twists and turns of the Trump administration’s trade policies. Looking ahead, market observers warn that continued turmoil in Washington or a White House that escalates tensions with its trading partners could create a longer-term crisis of confidence that could crimp consumer and corporate spending. “If the tariff skirmishes abate and die away, no big deal — the market will be fine… but if he doubles down on these kinds of efforts, rhetoric and policy then we’ve got a problem, because it is bad for business,” Zandi said.